Job creation empowerment is such that brings forwardness to the development of any Country, Without it, what could be the hope of the young at heart, being the youths. To skyrocket the development of any country, you can agree with me that job empowerment is one of the keys to that. 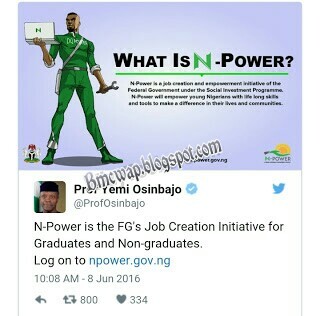 According to the broadcasting medium in Nigeria, known as the Nigeria Television Authority (NTA) and from the Federal Government, as it was announced, N-Power is a set out job creation empowerment initiative, found to be under the social investment program that will empower the young at heart in Nigeria, with equipped lifelong skills and as well as tools which will enable them make a welcomed and better difference in lives and communities. The aim of this Program set out, is to provide skills and livelihood to the Nigerian graduates and non-graduates. So, the very first phase of this N-power program, will focus on the alarming crucial needs in Nigeria's Technology creation, Education, Agriculture, Construction and as well as Artisanal industries. Aslo, in this program, there would be a preparation for a global outsourcing puch that will enable the youths of this country Nigeria, to export their services in order to work on global projects, which will in turn earn Nigeria, foreign exchange. Graduate entails, one having a minimum of a Bachelors Degree or a Higher National Diploma (HND) from any higher institution. Below are they phases and what they entails. In this phase, the training will be under Technology and creative industries. The Technology and creative industry is divided into three sections and they are; Creative, Hardware and Software. Under this phase, 75,000 unemployed Nigerians will be trained to have skills to jobs. Indeed, Great skills for a competent workforce batched with technicians, service professionals and as well as, Artisans. Do you have any question regarding to this post, kindly use the comment box for that and we will get back to you as soon as possible. Thanks.